The DataServ AP automation solution has provided approximately 30% gains in efficiency in the departments where it’s been implemented. The improvements our department gained with DataServ were almost instantaneous. Many of our processes improved, including our short-pay and approval processes, which before were challenging and involved many people and a lot of time. Liebert is a worldwide corporation, and there are invoices that need approval from all over the country. Consolidating all invoices to be mailed to specific P.O. boxes in St. Louis allows the Accounts Payable staff to digitally route invoices for approval. What in the past took sometimes weeks, now takes only a few days. We can already see more ways for making the process more efficient. This program is wonderful to work with. Our expectations have been exceeded. We recently added another 2,000 cars to the fleet and system. In the past, that required adding 2 FTE’s to handle all of the accounting/finance work. With DataServ, we do not have to add any team members to achieve this growth! We had a staff of people doing nothing but POD retrievals, and the invoices weren't tied to these POD's, so it was a time-consuming process. The system setup was taken on by DataServ on behalf of Sony. They understand the retail distribution model and their turnaround is quick. 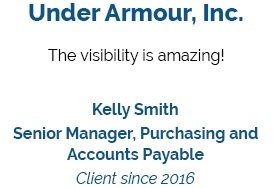 See what our clients are saying about our solutions! The DataServ interface is very straightforward and I love the dashboard because I can set my own alerts. We’ve benefited from choosing a partner with years of experience and one that’s a leader in document management outsourcing. DataServ has our best interest in mind with their philosophy of partnering to deliver the latest electronic document management, storage, and technologies available. Engaging DataServ was a good decision, and we are pleased with how DataServ has supported us. Our users have found the solution to be extremely easy to learn and use. And our exception process, which before was difficult and time-consuming, has been made very manageable. Now many of our other divisions are looking at DataServ as a potential partner for their payables applications. From the beginning, the Client Support team at DataServ was very knowledgeable about our AP process, which was really helpful. I didn’t feel the need to spend a lot of time explaining in detail what I needed. Whether I was emailing or calling the support solution desk, the response time was always impressive. I really felt comfortable knowing the team was there to assist with whatever issues I needed to get resolved. DataServ has an outstanding Client Support team. DataServ regularly evaluates our performance and suggests ways to improve, which helps us continually advance our processes.